Love sweets, but trying to stick to a low carb/no sugar plan? (I feel your pain, lol.) 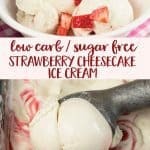 I’ve got a great sugar free and low carb Strawberry Cheesecake Ice Cream recipe to share with you today! Ice cream and cheesecake are two of my favorite desserts. Luckily these are two treats that are really easy to remake low carb. Last summer I bought a new ice cream maker (the kind with the bowl that you pre-freeze) and can have ice cream is ready in 20 to 30 minutes. I can’t tell you how many times this machine has saved me from indulging in the desserts the rest of the family enjoys. Love sweets, but trying to stick to a low carb/no sugar plan? 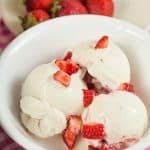 This sugar free and low carb Strawberry Cheesecake Ice Cream recipe is amazing! Beat together egg yolks and granular sweetener until combined and eggs are pale yellow. Add in cream cheese and continue beating until smooth and creamy with no lumps of cream cheese. Be sure to stop mixer and scrape sides of bowl. Add in all liquids (stevia, vanilla, milks) and optional guar/xanthan gum. Continue beating until completely mixed. Taste and add more stevia if desired. Add ice cream mix to ice cream maker and process according to your machines instructions. 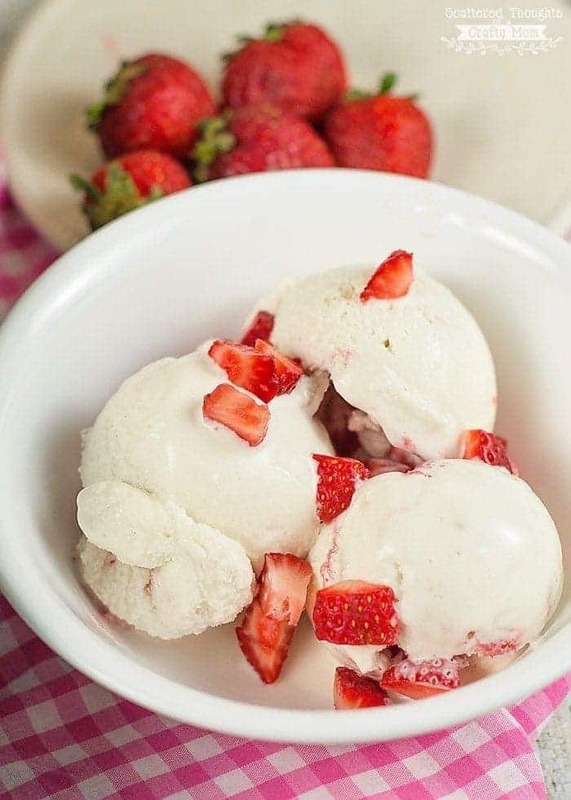 Serve immediately as soft serve- top with strawberry drizzle and additional diced strawberries. 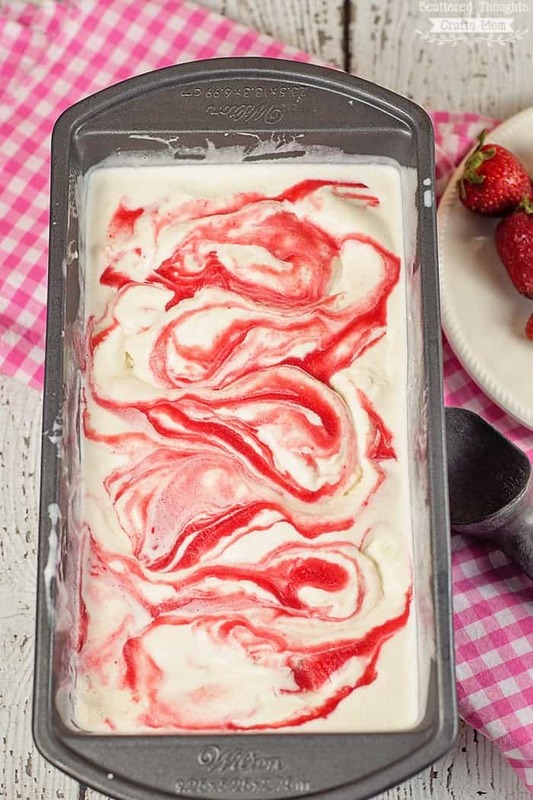 For a firmer ice cream, transfer to freezer safe container and drizzle with strawberry topping. If left overnight, this ice cream does freeze very hard (I’ve tried adding up to 3 tsp of vodka which didn’t make a difference.) Jut let ice cream rest on the counter for 5 to 10 minutes to scoop. Ice cream recipes with egg yolks usually involve making a custard with about 5 yolks. I’m curious what the point is of using only 2 egg yolks and whether it’s safe to use eggs without heating them. I’m not sure if I can get pasteurised eggs in Australia. Could I leave out the eggs without affecting the recipe? This is just the way I make it. Many people make cheesecake ice cream without eggs. I prefer an egg-based ice cream. Leave them out if you want. This is a small batch of ice cream designed to fit tin the 1.5 to 2-quart Cuisinart ice cream maker. 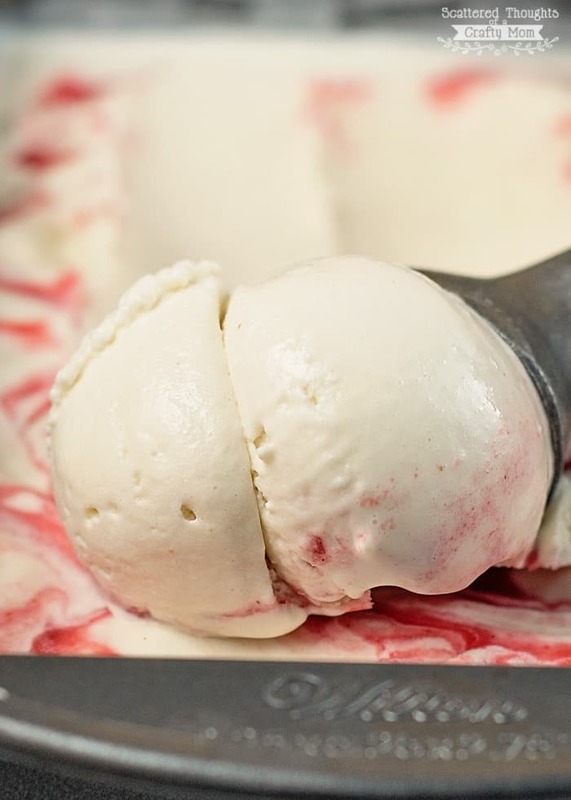 Many traditional ice cream makers hold 4 to 6 quarts, that’s why they have more eggs. You are welcome to use any pasteurized egg product, like the kind that comes in a carton. You could also cook the ice cream mixture, but would need to let it completely cool before processing it. I don’t like to wait that long, so I use a pasteurized product. No matter what direction you choose to take, I bet it turns out delicious as ice cream is yummy no matter how you make it. Let us know what changes you make and how it turns out. I thought this was awesomeness!!! Not too sweet and just the right consistency. Like a soft serve ice cream. I now have whats left in the freezer. I used stevia glycerite instead of liquid stevia since I didn’t have any and I have heard that the glycerite would help with keeping it from freezing so hard. Can I use heavy cream instead of the coconut milk and almond milk? You can definitely replace the coconut milk with heavy cream – I’m concerned that if you replace the almond milk with heavy cream too, It might be too rich to eat. So maybe use regular milk instead of the almond? I have free range chickens, so I need to pasteurize the eggs before since they are fresh and we raise them? I have not been able to find these pasteurized eggs lately, so I’ve been having to take the extra step to cook my eggs. (I can’t help that I am a freak about food safety, lol) It is up to you on whether you choose to cook your eggs or consume them raw. Stir in the vanilla and almond milk. Let mixture cool. Beat room temp cream cheese into ice cream base. Place ice cream base into the fridge until thoroughly chilled.